The Royal Toast Master? Supporters of U.S. President George Washington? William Makepeace Thackeray? Francis Bacon? Randall Munroe? An Anonymous Wit? Champagne to our real friends, and real pain to our sham friends. Pain to our sham friends, and Champagne to our real friends. Beauty without affectation, and merit without conceit. Champaign to our real friends, and real pain to our sham ones. From discord may harmony rise. George Washington? C. S. Wheatley? Apocryphal? Dear Quote Investigator: Are you familiar with the “liberty teeth” speech attributed to George Washington? Researchers have been unable to find evidence that Washington delivered this address, and some phrases are apparently anachronistic. Would you please explore its provenance? Quote Investigator: The earliest evidence located by QI was published in 1926 which was long after the death of the famous first president. Someone named C. S. Wheatley was the author of a short opinion piece about guns in a magazine called “Hunter-Trader-Trapper” based in Columbus, Ohio. 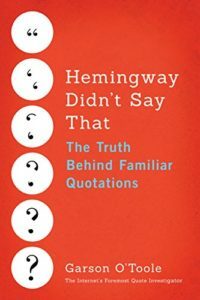 Some of the statements in the article were identified as quotations from the 1700s; however, each of these remarks was carefully placed between quotation marks. The term “Liberty teeth” occurred in the final paragraph of the article. Quotation marks were not used in this part of the text because Wheatley was presenting his own opinion. He was not presenting the words of George Washington. In George Washington’s address to the second session of the first Congress, he urged promoting the manufacture of arms. Firearms stand next in importance to the Constitution itself. They are the American people’s Liberty teeth and keystone under Independence. The church, the plow, the prairie wagon, and citizens’ firearms are indelibly related. From the hour the Pilgrims landed, to the present day, events, occurrences and tendencies prove that to insure peace, security and happiness, the rifle and pistol are equally indispensable. Every corner of this Land knows firearms and more than 99 99/100 per cent of them by their silence indicate they are in safe and sane hands. The very atmosphere of firearms anywhere and everywhere restrains evil interference and they deserve a place of honor with all that’s good. When firearms go all goes, therefore we need them every hour.